Sometimes things have a way of taking you somewhere special, and the fact that we struggled to find accommodation in Split made me look further down into Croatia and I found a place in Omis…I did a little bit of research and read that it is full of adventure, white water rafting, kayaking, zip lining and more than that the place looked beautiful, so we booked. 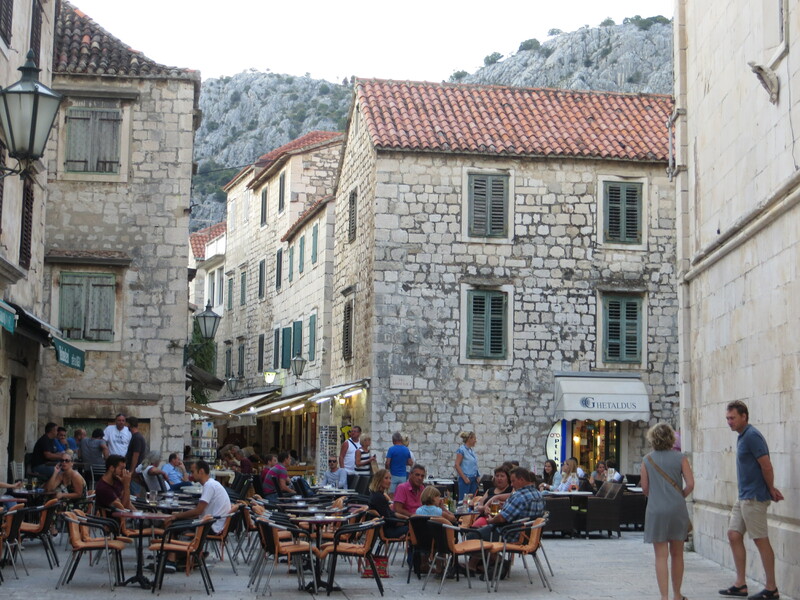 When we arrived in Omis the first thing you are amazed by are the mountains, they are breath taking, the river that runs through the middle of Omis and the very old very small little old town, it’s all gorgeous. We told the boys that whilst here we would do lots of relaxing, let them have some time at home and we certainly did that. We all had lots of fun, kayaking really is one of our favourite things to do…the boys really got into it, but enjoyed the relaxing a tiny bit more than the paddling. The cost was 240kuna (24pounds / 33Euros), we hired the kayak from 2.00 until around 8pm , we probably for that price could have had it all day. The company we used was ;- hrSlap go see Marin he is a very sweet guy, you can use this company for Rafting, Kayaking, they do tours to the waterfalls. Marin also drove us all the way from Omis to Dubrovnik. After our Kayak trip, we went back to the apartment, showered and got ready to pop out and try booking the Submarine trip that Lucas was really keen to do before dinner. We booked, had a little wait but soon were getting inside the red Submarine, as it took off we really hoped we would see lots of fish, as it was dark and and the light s of the submarine were on, but we didn’t see much, a few tiny little silver fish and lots of very large clams. We did get to see a ship wreck and there were a few more fish around that, but it was a little bit of a disappointment, on the way back I decided to go up above and look at the view, that was really pretty, looking at all the lights in the mountains and the lit up fort on the top, listening to the music from the party boat, Jake, Lucas and I had a little dance :). Would I recommend this trip, Nope not really, but it was fun being inside a submarine, and the view from the top coming back made up for the lack of view underneath. The buildings around the old town are not very in keeping, some are plain ugly, but when you step into the old town, you are treated to lots of character, it may be small but it has lots to offer, restaurants almost the whole way down the one street, with lots of little shops selling different flavour liquors, tourist souvenir shops and travel agents selling many different tours. We had to take a walk up the little fort, it didn’t look too hard and it wasn’t, the view from the top were pretty awesome. The beaches are not my favourite, I am not a huge fan of gravel beaches at all, but the pebble beaches are pretty, it makes for a crystal clear ocean, but hard on your feet..
We knew we had two really good days coming up and then the weather forecast was saying possible rain so we thought we should book the trip to the waterfalls. We were offered to be taken in aircon car, trip took over an hour and 30 mins, to National Park and they would wait for us until we were finished in park and then drive us back for 120Euros. Marin our driver was really sweet, it was a long drive thought we were never going to get there, once inside the park we had to pay a further 50Euros, the park bus took us closer to the waterfalls then we also had to walk about 45 mins, but once there is was certainly all worth it, the waterfalls were amazing, straight from a picture postcard…we all couldn’t wait to jump into the exceptionally clear water. Cost 180Euros (130 pounds) for the whole trip. We were starting to get ourselves into bad eating habits, the boys were starting to expect a treat every day, so we all decided that we would spend an entire month only eating healthy, we ate lots of chicken, veg and tons of fruit, we all tried to eat nuts but non of us are huge fans, I don’t mind if I also have a hand full of raisons. Jacob has surprised us and been the most dedicated, but he is my fruit boy, Lucas struggled a bit because he loves his treats, me I realised that we should always eat like this but also treat ourselves once in a while…so we are going to still try and cut down on the treats, but not deny ourselves totally. Do we feel any different, I think Jake liked the halo, but we all very much looked forward to our 1st day in Dubrovnik where the detox / diet finishes. Never seen thunder and lightning storms like we did in Omis, they were scary, fun and awesome all at the same time. When we first arrived at the bus stop from Split, we hoped we had got off the right stop. The host came to meet us and show us back to the apartment, we were instantly impressed as the place had lots of space, 4 bedrooms, living room, kitchen and two balcony’s, it was only when we were told our internet connection was a 3g usb key, we all looked at each other thinking this isn’t good, how are we going to work and school on this, we had a challenge certainly one that we could have done without. But we have managed to work and school, with connections from the cafe over the road plus we purchased a sim for a few of our phones…so al in all it ended up working out do-able. But we will certainly be making sure we have better coverage next time. Aside from that we were happy in this apartment, we had a lot of space and the boys got a bedroom each.